It’s November, which means National Novel Writing Month, so for Tuesday Tales this month I’m jumping to another WIP, My Wildest Dreams. This tale follows the prequel, A Second Chance, where Jenny survived Sudden Cardiac Arrest and desired to honor her second chance by living an authentic life. She decided she wanted to own her own herb and garden store. Join us as we catch glimpse of her here as she follows her wildest dream, with the help of her best friend Carla. This week we’re writing to a picture prompt, one of two selections: a country barn scene, or a roaring fireplace. 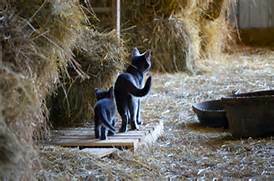 I chose the barn as Jenny and Carla are on their way to a llama ranch. Return to Tuesday Tales here, to read the other snippets from talented writers. “I did. Twice. I’ll try again.” I pulled my phone from my back pocket and pressed his name on my screen. When the call went to voice mail – again – I tapped end call and dropped the phone on the counter in disgust. “I should have known not to trust leaving him here on a Saturday by himself,” I muttered. We headed out for the llama ranch, leaving Dillon in charge of the herb store for the day. The directions weren’t complicated. There were turns here and there as we traveled the farm to market roads the back way to Ponder. The rural scenery was green and lush as the intense summer heat settled into north Texas yet. I enjoyed seeing the verdant farmland. Traveling down what I thought was the correct road, the asphalt ended and a dirt drive pointed the way to a red barn setting in the midst of towering post oaks. But…no cars. No signage. No obvious pasture land. This week we’re writing to the prompt ‘nasty’. Return to Tuesday Tales here, to read the other snippets from talented writers. Just when I thought we were going to make it through this winter without any nastiness. I stood in the kitchen opening cupboard doors, scanning the pantry contents. I checked the refrigerator to double check if there was anything I needed, in case the reporters were right. Usually I was set fairly well and could eat of my cupboards for a good month or two, except for a few perishable items. This time though, trying to keep my expenditures notched down in readiness for my new business venture, I hadn’t been purchasing as much in the grocery store as I typically did. Out came the list and I jotted down a few necessities to run out and pick up the next day. By the time I got to the store the next morning, it seems that multitudes of others had the same idea. Except that they’d gone earlier than I did. The loaf of bread I’d written on the list? That wasn’t going to happen. The bread shelves were bare. I tossed a pack of hamburger buns in my cart and considered myself lucky. The milk racks were in about the same condition. There wasn’t very much left. I found a small container of chocolate milk and added it to my meager collection. I made it to the eggs before they were wiped out and picked up two dozen. Water bottles also were in scarce supply. I found a gallon jug of a pricier brand and scooped it off the shelf. The soup cans were just as picked over, but there were a few selections still waiting for the late vultures. I hoped the forecasters were wrong. The television was turned on that evening, to stay abreast of the news. I watched the storm progress, up from the gulf and north through this huge state. The house got colder with each advancing hour. To avoid the heater running so hard trying to keep the house warm, I dropped the thermostat a few degrees and added a sweatshirt. After a while, I opened the front door and peered out, shutting it quickly when I saw the white tempest outside. February weather. It was not my friend. When I peeked out the windows the next morning, I was glad to see the storm had past. I also had to admit that the pristine, icy world it left in its wake was beautiful. As long as I could view it through the window of my warm house and didn’t have to be out in it. Not a single vehicle had gone down the street. The landscape in front of me was almost like one of the gorgeous snowy scenes on a Christmas card. But instead of white fluff surrounding us, it was a white layer over top of a nasty, icy crust. Texas shuts down during an ice storm. The Midwest and the East laugh at us, as they keep on with life in their winter wonderland. But ice…nope, this California girl does not drive in ice. I was glad I’d gone ahead and picked up a few groceries. For four days I couldn’t get out of my driveway. Not that I tried the first few days. The temperature never rose over twenty-four degrees. It was cloudy and dull, not a speck of sunshine to brighten our world – nor warm the icy layer cast over us. By the second day, one or two vehicles made tracks down the street. I could hear one crunching along early one morning, making its way down the street very slowly. It sounded like a diesel, so it was probably four wheel drive. I didn’t care enough to get up and watch. I stay snuggled under my warm covers. By the fifth day, the sun finally broke through and the temperature rose to a high of thirty three. The down time gave me a chance to catch up on crafty projects for the store. I took advantage of that and worked up everything I could, until I was down to projects that needed one more piece, one more bottle of paint, one more item before it was complete. And I wasn’t going to go slide around on ice for a small bottle of acrylic paint, that’s for sure. I pulled out the calendar to review the schedule I’d penciled in. There was no way I could open in one week. Without being able to move the large pieces in, and losing four days of making it to the shop, I’d lost too much critical time. It was going to be close anyway. But the ice storm had set me back too far. Maybe I could move the opening to mid-March? From past experience, I also knew that after a storm of this magnitude it would take a week or two before the world returned to normal. Not only had we cleared the grocery store shelves of produce and goods, trucks bringing new merchandise couldn’t get in to deliver their goods either. I decided to push the opening back to April first. April in north Texas is nicer weather. People are excited to get out and about after a cold winter. And gardeners are starting to put in their first crops. Our mother’s advice to our younger selves still comes in handy, as much as we hate to admit that we can hear her words echoing in our adult ears. Her words still apply today, even though we’re not fussing with our siblings, or having arguments on the playground. Count to ten before we hit ‘send’. Count to ten before we answer our manager’s rude request. Count to ten before we respond in anger to the irate customer that’s been battling with us for the past five minutes. Although, it’s probably a good idea to count quietly inside our head and not out loud – in the interest of not riling the customer, or manager, any further. When you’re having one of ‘those days’ and you’re tempted to blast the next person that crosses you, pull up a little mom advice from years ago and try it out. Count to ten. It’s not an answer for every situation that plaques our work environment, but there are times that these three little words are worth their weight in gold. This week we’re writing to the prompt ‘cup. Return to Tuesday Tales here, to read the other snippets from talented writers. There we were, driving up 377 towards Denton, a route we’d taken so many times together. Chattering a mile a minute, we were catching up after the horrid retail time was behind us. On a cold January day, there’s not much sightseeing to be doing in this area. The scenery looks much the same. Dead and bleak. Before I knew what was happening, Carla pulled the car onto the shoulder and almost screeched to a stop. “What’s wrong?” All sorts of imaginings raced through my mind. Flat tire. Overheated. Hurt animal on the side of the road. “The brick one?” Which other one could it be? 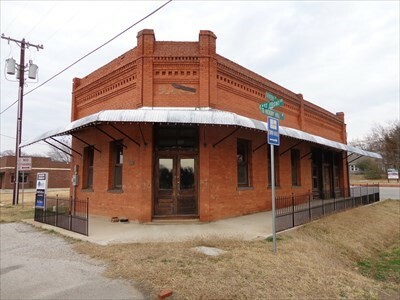 There was only one old bank building in Argyle, the brick one sitting on a corner, a relic of the past. We’d both admired it every time we drove through this area. It always sat empty and neglected, looking forlorn as if no one loved it anymore. “There’s a ‘For Rent’ sign on it.” Carla was already opening the door and sticking a leg out. I joined her behind the car and we hiked back to the corner. She was right. A huge sign hung in the large window. ‘For Rent’ with a number. I patted my pockets. Of course, no pen and paper. I debated about jogging back to the car to grab one out of my purse, until I remembered the cell phone in my pocket. I quickly snapped a picture of the sign. I don’t think Carla heard me. She was already up by the building, peering in the other window. My mind was whirling with the possibilities over an old historic building like this. And I hadn’t even seen inside yet. I’d be in heaven if I could have my business here. “Maybe.” She was right. The bank was flanked by a large open field on one side. The back side had a dilapidated asphalt area that appeared to have been a parking lot at some previous point in time. It would be necessary as there were only spaces for about three cars on the front street side of the building. The area on the side street didn’t have any parking. A deep gulley run alongside the building. Hopefully it was adequate to carry heavy rain waters away and keep them from flooding the building. I thought about it as if I were already a tenant here. Pretty presumptuous, Jenny. You haven’t even called about it yet and you’re already making plans for having a business here. The field and the area behind the old brick building might come with the rental. They might not. There was only one way to find out. Of course, dialing the number on a Sunday afternoon only got me to voice mail. I left a message and crossed my fingers. I walked up to the doors, set in the angled corner of the building as was so common then. Cupping my hands around my face, I tried to see through the dusty window. Not much existed inside. I could barely make out the empty shell of a large ‘L’ shaped space. 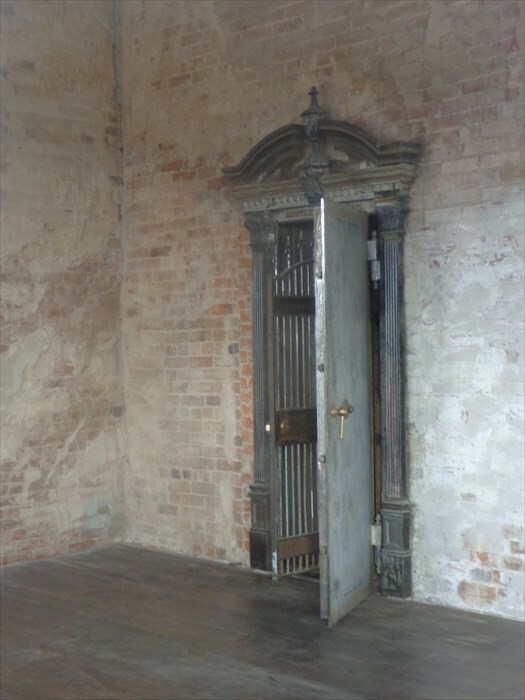 Directly across from the front door, there appeared to be an interior room with a large, ornate door going into it. I wandered around the side of the building, towards the back parking area. To call it a parking lot was rather grandiose. It could do. The ragged edges of what used to be a structured parking lot didn’t have any remaining striping. However, it was better than parking on a dirt or gravel lot. And there was plenty of room around the sides that could potentially have planting areas surrounding the old lot. Without the formal edges that many commercial spaces utilized for plantings, it could be a unique, rustic space, complementing the vision I had for my herb business. Visions of having my herb and garden shop situated in a historic bank building filled my thoughts for the rest of the day. Every time Carla said something, I’d have to reel myself in back to the present and have her repeat whatever she’d said or asked. After their first season as trail angels, opening their home to thru-hikers coming through Wrightwood, California, Sue Holman wonders if her family will ever want to eat brownies again. Brownies proved to be a popular dessert. For Sue, cooking for a houseful, the brownies made a quick and easy dessert. The hikers, after being on the trail for several hundred miles by the time they made it to Wrightwood, appreciated the tasty, chocolaty snacks. Here’s a short excerpt from Trail Angel Mama. And sending a special congratulations to Zach (Face), who completed the trail on September 15th and made it home in time to become a daddy to a sweet, precious munchkin. A mid-May snow storm in Wrightwood left four hikers cold, wet and looking for a warm room for the night. We got a call from Zach and Mike headed right into town to pick them up. By the time he got there, they and their packs and sleeping bags were soaked through. A roaring fire and a hot dinner greeted our guests when they arrived. It was an easy meal for me to fix; baked spaghetti, salad and garlic bread. 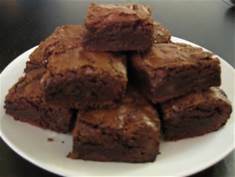 A batch of fresh baked brownies was a dessert that everyone enjoyed. With our tummies full and the fire keeping everyone warm, we sat around exchanging stories. These newest four were a diverse group, as I’m seeing most are. Zach, or ‘Face’ as he’s called on the trail, isn’t a newbie hiker. He hiked the Appalachian Trail (AT) in 2011. He’s 29-years-old, from Mississippi and likes to garden and make homemade mustard. Jack, with the trail name ‘Catwhacker’, is a 25-year-old from Oregon. He’s an environmental engineer and he’s taking this time on the trail before he starts his master’s program in August. While female hikers traveling alone may be the minority on the trail, it’s not unusual to see them. Rachel, or ‘Gazelle’, is an adventurous 23-year-old from Canada. She lived in Asia for a year and wants to live in New Zealand in the future. She’s working her way, a mile at a time, back toward the Canadian border and home. Ram was the oldest in this group of four. He also traveled the furthest of this group to hike the PCT, being another one that came from Israel. As much as we all enjoyed meeting one another and sharing stories, our hikers were exhausted. After hiking a 29 mile day, through a light snow storm over Mt. Baden-Powell, then eating and sitting around a fire, energy levels dropped and we all headed to bed by 9:00. This guest room of ours is starting to get a work out. 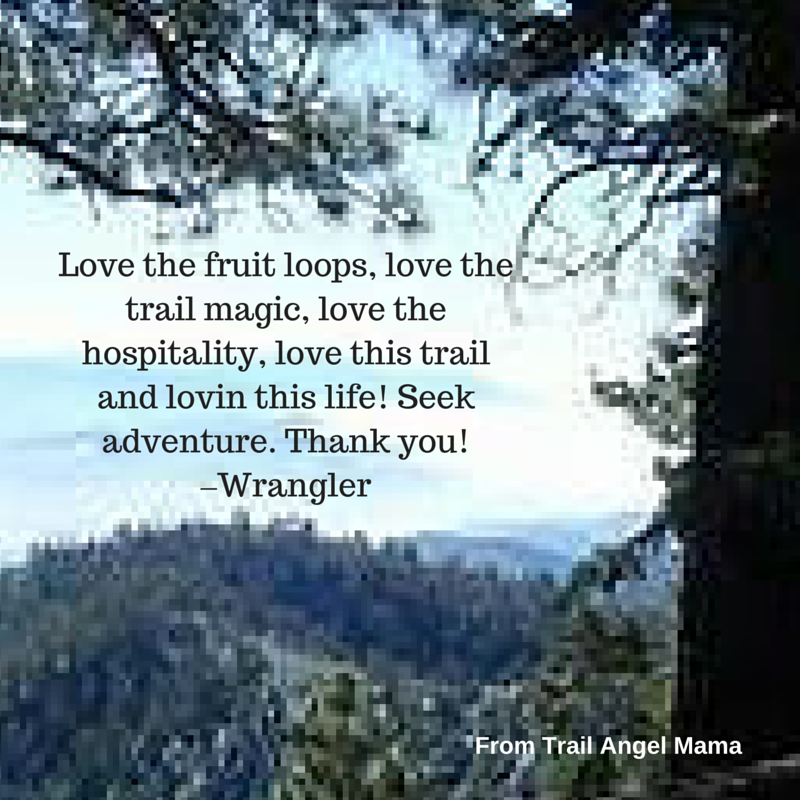 Trisha Faye, along with her trail angel sister Sue Holman, wrote Trail Angel Mama. After the Holman’s experiences sharing trail magic to thru hikers in the Wrightwood area of the Pacific Crest Trail, the whole family now advocates sharing magic with others – whether they’re on a hiking trail or just on the journey of life. This week we’re writing to the prompt ‘flavor’. Return to Tuesday Tales here, to read the other snippets from talented writers. “Speaking of herbs for cooking…let’s go eat. I’m cold. And starving.” Carla rubbed her stomach to emphasize her words. I smiled, thinking to myself that I should have known. 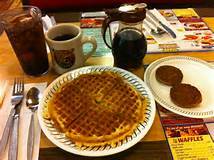 Carla’s choices consisted of Waffle House or Mexican. Oh, occasionally she went the Barb-B-Que route, or chose burgers or a Sonic chili dog. But nine times out of ten, it was one of her two favorites. Soon we were out of the woodsy area and seated in a booth of our favorite hangout. We each scanned the menus, although probably neither one of us would order anything different than what we usually got. Carla asked for coffee as soon as we sat down, while I only asked for a water. “They don’t have a flavor I like. Now, if they had a nice raspberry or peppermint tea, I’d be all over it.” I realized where we were and started laughing. “I’ll have to take a picture of our meals and send it to my sister.” I pulled my phone out of my pocket and sat it next to my water glass, to remind me. Crazy friends. Don’t you just love it when your best friends parrots your words and throws them right back at you? I shook my head and tried to rub my frown lines off my forehead. Fortunately our meals arrived, giving me some time to think. I hated to admit that Carla was right. I was so discouraged and overwhelmed, that my dream seemed impossible. I wasn’t using my own words on myself. I was looking at the negative and kept repeating these negative thoughts to myself. Where was the positivity that I talked so freely about? I was doing the same thing that I berated others for doing – the old adage ‘Do as I say and not as I do’ hit too close to home right now. 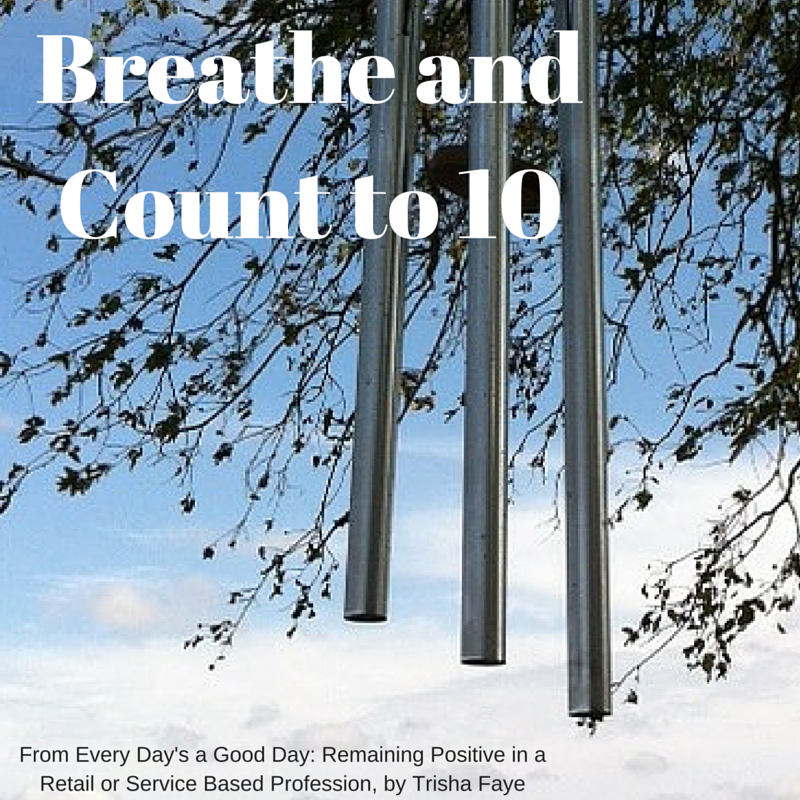 Today’s post is a selection from Every Day’s a Good Day: Remaining Positive in a Retail or Service Based Profession, scheduled for release February 2016. 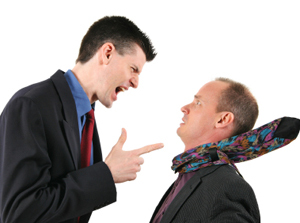 Rude and berating bosses and managers – they’re out there. I think everyone has at least one horror story in their past of what it was like to work for a tyrant. Do we speak up? Do we voice our opinion about how that isn’t the way to treat an employee? Some do. But I venture to guess that most of us don’t have the nerve to call them on their behavior. Instead, we grumble about it, rant and rave to our friends, bite our tongue, toss down antacids and try not to pull our hair out as our stress levels ratchet up through the roof. Or, we simply walk away. Or run. That’s me. I reach my outer limits of what I can tolerate and simply quit. There is another method. 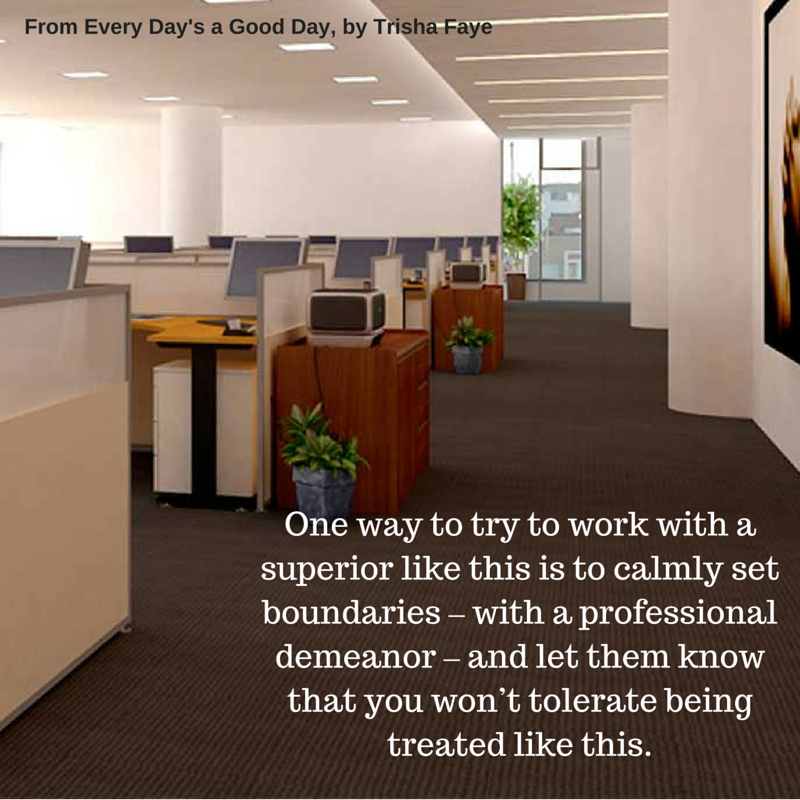 One way to try to work with a superior like this is to calmly set boundaries – with a professional demeanor – and let them know that you won’t tolerate being treated like this. Now I know that some people have no problem with this. They stand up for themselves in all aspects of their life and this is just one more arena. Those people are probably reading this and scratching their heads in amazement, because they can’t understand how it is that the rest of us don’t use this. Of course, there’s also a third group of people. Those that have no problem at all letting the boss know what they think of their obnoxious behavior and emphatically stating what they will and won’t tolerate. The employees in this third group though, while not condoning rude treatment, also don’t always respond in a courteous and professional manner themselves. I can think of several co-workers in my past who fall in this category. I don’t really want to be like them either. I’d like to think that I can remain above the yelling and the name-calling that sometimes ensues. A respected writer I follow posted a blog entry about a time in her early career where she had to deal with a nasty editor. She reports that she turned the situation around, and eventually had a good relationship with that editor by keeping it professional and drawing boundaries. She tells how he made it clear – in a very loud voice – that he was not happy with the quality of the piece she turned it. After he threw his little tantrum, she calmly told him that it wasn’t alright for him to yell at her and she wasn’t going to tolerate it. She says that she told him she would treat him with respect and expected the same behavior from him. At first there was silence she says, and then he said ‘ok’. She then proceeded to question why he thought the work was substandard, asked what she needed to do to fix this piece and turn in higher quality pieces in the future. It turns out that there was an item she’d missed. But now she knew what she needed to do…and found out by replying civilly to the beast. She recommends that if you’re dealing with a volatile boss to not give up hope, stay calm, don’t run and draw boundaries, while keeping it professional. Is your boss or manager someone explosive like that? Have they forgotten how to treat employees with respect? Do you go home at night with a curdled stomach from having this abuse heaped on you? Try this out. Ask for a meeting with them. Try to talk this out in a businesslike manner and set some boundaries, letting them know that you won’t tolerate their continued abusive treatment. But don’t stoop to their level. Maintain a courteous demeanor. You may just walk out of work tonight with your head held higher. Pat yourself on the back. You deserve it! My own experience with trail magic has been seeing it vicariously through my sister and her husband, trail angels on the Pacific Crest Trail. Trail magic abounds on hiking trails throughout the country, even on one of the oldest and best known trails – The Appalachian Trail (AT). The AT, technically the Appalachian National Scenic Trail, is a 2,200 mile hiking trail that extends from Georgia to Maine, through 14 states: Georgia, North Carolina, Tennessee, Virginia, West Virginia, Maryland, Pennsylvania, New Jersey, New York, Connecticut, Massachusetts, Vermont, New Hampshire, and Maine. Thirty one trail clubs and partnerships maintain the path. It’s managed by the National Park Service, United States Forest Service, and a nonprofit organization, the Appalachian Trail Conservancy. Never before have I been so blessed by so many strangers. These acts of kindness completely blew me away, for they certainly exceeded basic rural southern hospitality. It seems like the kindness on the trail just multiplies as it touches each of us. Every hiker wants to “do trail magic” when we finish. In fact, my dad was so touched that, when he went back to civilization after hiking with me two weeks, he started planning trail magic for the next time he meets up with me! Zach Davis thru-hiked the AT in 2011. He blogged about his hiking experiences and later wrote Appalachian Trails: A psychological and emotional guide to successfully thru-hiking the Appalachian Trail. His blog, The Good Badger, tells about several of the trail magic experiences he encountered is entertaining and is evidence about how much trail magic is appreciated by the hikers. In 2014 Zach was named the Top Hiking and Outdoor Blogger by USA TODAY. Locate events in developed areas on durable surfaces. Large gatherings in the backcountry can lead to trampling of plants, soil compaction, and disturbance of wildlife habitat. Trail towns and local parks are better locations. Keep events small. Consider whether your event may be contributing to an overabundance of trail feeds in the local area or region. Some hikers come to the Trail to seek solitude and contemplation. Prepare and serve food safely. If you will be cooking or preparing food, check with the landowner to find an appropriate area and learn what food-safety or other regulations apply. Permits may be required. Charging a fee or asking for donations may not be allowed. Be present if you provide food or drink. Unattended items—including their packaging—can harm wildlife that consume them, or hikers, when unrefrigerated products grow bacteria or become contaminated. Unattended items are considered litter and their presence detracts from the wildland character of backcountry environments. Dispense food and drink in person, and carry out any trash or leftovers. Restore the site. Leave the site as you found it—don’t create a burden for Trail volunteers whose time is better spent in other activities. Advertise off-trail. 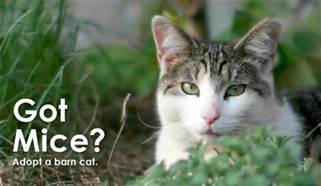 Advertising—even noncommercial—is prohibited on the A.T. Publicizing a “feed” in advance can lead to clumping of long distance hikers, causing overcrowded conditions and avoidable impacts at shelters and campsites. Forgo alcoholic beverages. Don’t risk the legality and liability associated with serving minors, over-serving adults, or the safety issues associated with intoxicated hikers. Whether you hike or not, whether you live near the AT or another hiking trail, we hope that you’ll consider being a trail angel. 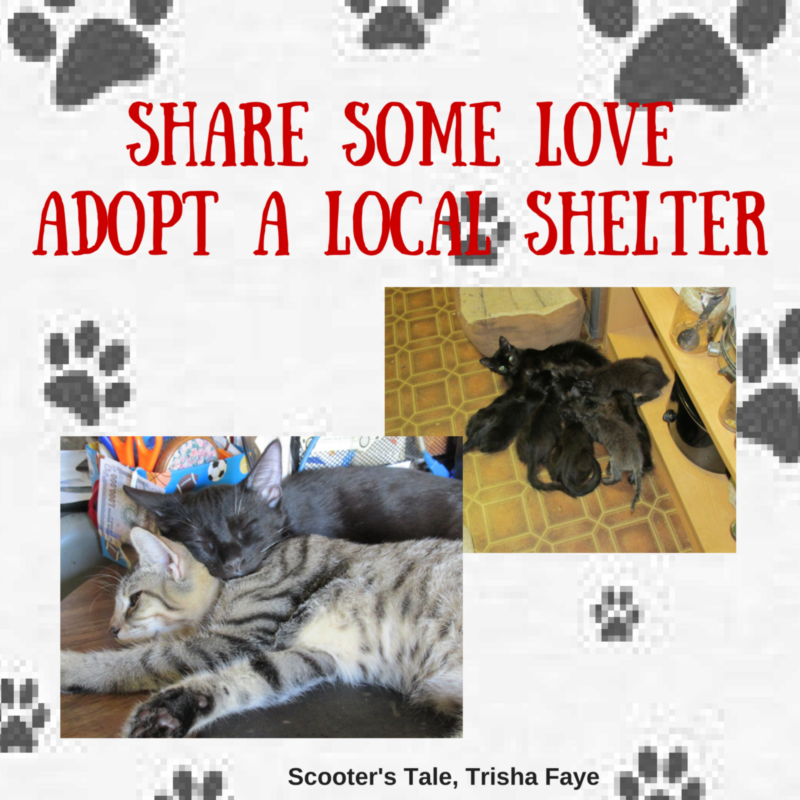 And if not for a hiker…maybe you can pass along an act of kindness to someone else in need. Trisha Faye, along with her trail angel sister Sue Holman, wrote Trail Angel Mama. After the Holman’s experiences with sharing trail magic to thru hikers in the Wrightwood area of the Pacific Crest Trail, the whole family now advocates sharing magic with others – whether they’re on a hiking trail or just on the journey of life.